In May of 1952, the hunt was already underway for a new light tank that would replace the M41 Walker Bulldog which had only entered service the previous year. Three companies were competing for a production contract. These were the Cadillac Motor Car Division (CMCD) of General Motors Corporation (GM), Detroit Arsenal (DA), and Aircraft Armaments Incorporated (AAI). Cadillac and Detroit would compete individually with their own designs. These would both be designated as the T71. 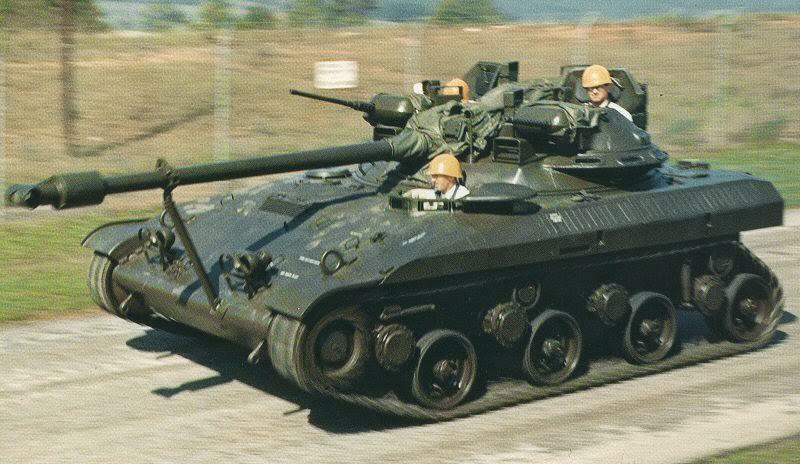 The T71 was rather traditional in its design when comparing it to AAI’s proposed tank, which was rather unique, to say the least. As such, the latter vehicle would receive the designation of T92. After review, a contract was handed to the AAI to produce a full-scale mock-up. Their tank was considered an extremely innovative design which offered greatly improved performance over previous light tank models. This also meant that it included newly developed features including some which were so novel they had never been tested before, which is considered risky when building a new tank. The Chief of the Army Field Forces and the Assistant Chief of Staff authorized development of the tank in late July 1953. The United States Ordnance Technical Committee also approved the design in March 1954, with clearance given to produce a pilot vehicle. On the 18th June 1954, AAI was given permission to build an additional pilot vehicle. Meetings on the 5th of November 1954 and 27th of January 1955 resulted in recommendations for numerous design changes. Development continued into January 1956, at which point the competing T71 project was canceled. This was thanks, in no small part, to the rapid progression of the T92, and the troublesome development of the T71 which ran into funding issues. Welded steel armor and castings formed the hull of the T92, which was extremely flat and made up of oblique surfaces. The hull was wedge-like in its shape and extremely low profile. One of the more outlandish thoughts behind the shape was that it would help to deflect the blastwave of a Nuclear Blast should it have taken one head on. The armor thickness was almost identical to the M41, which was 31.7mm (1.2 inches) at its thickest, but it was considerably lighter at 18-tons than the 26-ton Walker Bulldog. This was due to a reduction of overall parts, with some constructed from Aluminum alloy. Such parts included the access doors of the power plant, generator, and battery compartments. The fenders were constructed from a blend of Aluminium and fiberglass reinforced plastics. It was designed to be as light as possible to allow it to be air-transported or deployed via-parachuted drop. Access into the hull, as well as the various cupolas over the various crew positions, was through a rather large, square two-part armored door in the rear. Each door was fitted with a vision block. To the left of the doors was stowage for the pioneer tools (shovel, pick-ax, etc). To the right was stowage for two fuel “Jerry” cans. These were stored vertically with one on top of the other. The T92’s power pack consisted of a 357 horsepower AOI-628-1 (AOI: Air-cooled, Opposed, Inline) engine that was located in the front right of the hull. It was connected to an Allison XT-300 transmission providing 6 forward and one reverse gear. The top speed on road was 35 mph (56 km/h). There were two air intakes; the large grill on the upper glacis and a ‘mushroom’ ventilator at the right front of the turret. The exhaust ran to the back of the vehicle under the right sponson, ejecting fumes through a grille at its rear. The whole power pack (engine & transmission) could be removed and installed as one piece. Fuel was stored in two 75-gallon (341 liters) bladder-type tanks for a total of 150 gallons (682 liters). These bladders were located at the rear of the hull. The driver sat to the left of the engine, just in front of the turret ring and was protected by a steel firewall. The vehicle was operated by two small control handles that were used to steer and brake. He had a hatch above his head fitted with vision blocks. It swung open to the left on a pivot. There was also an escape hatch beneath his position. Suspension on the T92 consisted of a Torsilastic system which is not commonly used on armored vehicles. In the case of the T92, this consisted of a cylinder attached to the hull sides. This intern, consisted of a hollow shaft and a coaxial tube, with rubber between the shaft and the tube. The rubber was sulfurized to make sure the shaft and the tube were firmly attached. The Torsilastic suspension type eliminated the friction between metal parts and thus did not need to be lubricated as often as standard suspension types. The rubber acted as an elastic element, as well as a shock absorber, meaning the vehicle could be quieter and more comfortable to drive. This suspension system was also used on some LVT models and the M50 Ontos. The external nature of the Torsilastic suspension saved a great deal of room inside the vehicle that would otherwise have to accommodate the long torsion bars of a traditional suspension. There were 4 road-wheels per-side, each with a corresponding suspension unit. The drive wheel was at the front, and did not have traditional external teeth. There were long posts around the wheel which slotted in guide holes in the track which would pull it around. In the initial design, there were no return rollers. As such, the track would’ve been quite slack over the return which could result in ‘track-slap’ damage or the loss of the track. The meetings of November 1954 and January 1955 brought this to light, and it was recommended that at least two return rollers be installed. One was installed behind the suspension unit of the second road wheel, the other was installed behind the suspension unit of the last road wheel/trailing idler. The tracks were a band type which did not require pins to hold the links together. They were mostly rubber and reinforced with steel cable, and were rather thin at just 16-inches (40.64 cm) wide. The full length of the track was 390.25 inches (9.91 meters), composed of nine separate sections. Two spare sections were stowed on the gun cradle at the rear of the turret. 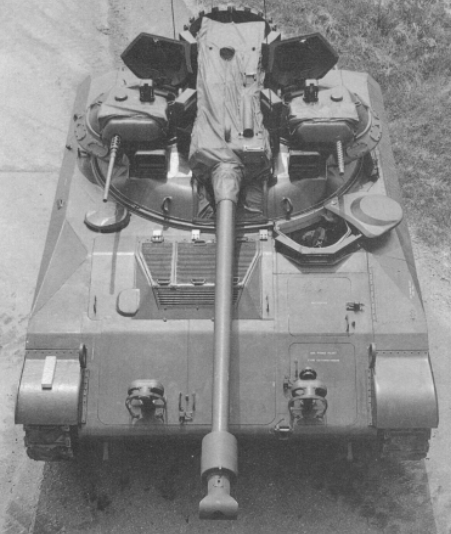 The turret and arrangement of the T92’s armament was perhaps the most unique feature of the vehicle. It sat on an 89-inch ring and was cleft in its design, with a large hollow in the middle cut out for the 76mm Main Armament. On either side of the gun were two cupolas which could rotate independently of the turret and were armed with machine guns. The one to the right of the gun was the commander’s and the one on the left was for the gunner. These cupolas were based on commander’s cupolas found on the M48 and M60 tanks. In the initial design of these, it was intended for both of them to be armed with Browning M2 .50 Caliber (12.7mm) machine guns. However, in the meetings of November 1954 and January 1955, it was decided to replace the machine gun in the Gunner’s cupola with a Browning M1919 .30 Caliber (7.62mm). The cupolas retained the ability to mount either weapon. As well as the vision blocks in these cupolas, both the gunner and the commander were equipped with periscopes that enabled them to look over the gun. The cupolas were manually traversable but could also be brought into line with the main armament with the use of hydraulic slewing motors. The traverse range was 194 degrees, 10 degrees inboard forward, and 4 degrees inboard aft. The machine guns could elevate manually through a range of +60 to -10 degrees. Beneath each cupola was a suspended seat for the respective crew member to sit on, under which were drums for the machine gun ammo. Both the gunner and commander could traverse the turret, aim and fire the main armament. The power elevation and traverse controls, as well as the gunnery controls, were mirrored in the commander’s position. The commander could override the controls to lay the gunner on to a target or engage it himself. 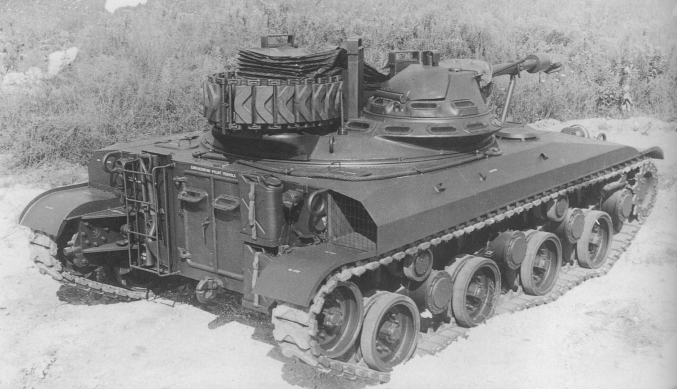 The early version of the T92 utilized a trailing idler wheel instead of the traditional raised version which was added to the vehicle at a later date. This side view shows off the Tank’s unique profile. Illustration by Tank Encyclopedia’s own David Bocquelet. Main armament of the T92 consisted of the 76mm Gun T185E1. This gun was ballistically the same as the 76mm Gun M32 found on the M41 Walker Bulldog and was even fitted with the same T-shaped single-baffle muzzle-break and fume extractor. This gun could fire Armor-Piercing (AP), High-Velocity Armor-Piercing (HVAP) and High-Explosive (HE) rounds. The major differences with the weapon was its quick-change barrel, and the fact it was mounted upside down. This was to accommodate a semi-automatic loading system. The loader, who was seated in the left rear of the vehicle, placed one of the tank’s sixty 76mm rounds (28 in the main rack, 24 in the dispenser rack, 7 in the ready rack, and 1 kept in in the loading system) onto a tray behind the breach. When it is properly seated on the tray, it is automatically locked into position. The loader then held down a button for the duration of the cycle which consisted of the round being brought into line with the breach (whatever the guns state of elevation) and rammed in. The gun also featured a fully-automatic ejection system. When fired, the gun’s recoil would push the spent cartridge out of the tank through a small void in the armored box surrounding the breach. This was seen as essential as without it, the small crew compartment of a light tank like the T92 would soon fill with large, empty 76mm cases and the resulting irritant fumes. The gun was mounted in a cradle in the center of the turret. The breach end was protected in an armored box and extended back to the rear of the turret. When the gun was depressed, the breach end lifted out of the turret roof. When the gun was elevated the breach sank into the hull. The voids created between the gun and body of the turret were covered with a canvas screen. Maximum elevation was +20 Degrees, maximum depression was -10 degrees. A semi-circular cage which acted as a guardrail was installed at the rear of the turret to protect the breach. It was to this that spare track sections were stored. Mounted above and to the left of the main gun was a coaxial Browning .30 Cal (7.62mm) M1919/M37 machine gun. T92 Pilot No. 1 arrived at the Aberdeen Proving Grounds (APG) for tests on the 2nd of November 1956. Due to a miscommunication with constructors, some parts were missing from the vehicle. Namely, the Commander and Gunner’s cupolas. Weights were added to the positions to simulate for the automotive tests before the cupolas arrived at Aberdeen and fitted. T92 Pilot No. 2 arrived at Aberdeen on the 22nd of July 1957. This vehicle was used to evaluate the crew and their respective compartments and positions. At the time, it was expected that the T92 would enter full-scale production by mid-1962. Testing at Aberdeen identified a number of areas where the tank needed to be improved. These were mostly with the suspension. The band type track proved to be prone to breakage and throwing. After just 202 hours of test time, the track was replaced with the thinner (14-inch/35.56 cm as opposed to 16-inch /40.64 cm) traditionally linked tracks of the Light Tank M24 Chaffee. There were no long-term plans to keep this track for the production model, and plans were made to design a stronger band-type track. The adoption of this track necessitated the modification of the sprocket wheel to the traditional type with external sprocket teeth. Another attempt to stop the track being thrown was the addition of a compensating idler wheel. This was the most drastic of the changes. Such idler wheels were mounted on a lot of tanks of the era, such as the M48, M60 or M103. They are attached to the closest roadwheel by an actuating arm. When the roadwheel reacts to terrain the idler is pushed out or pulled in, keeping constant track tension. These were mounted on a frame that was welded to the vertical rear plate of the tank. In 1957, funding was made available for two further Pilot vehicles, each one would have the suggested improvements incorporated. Delivery of these was expected by mid-1958. However, the order was canceled prior to completion. In 1957, it was discovered that the Soviets were working on an amphibious capable light tank. 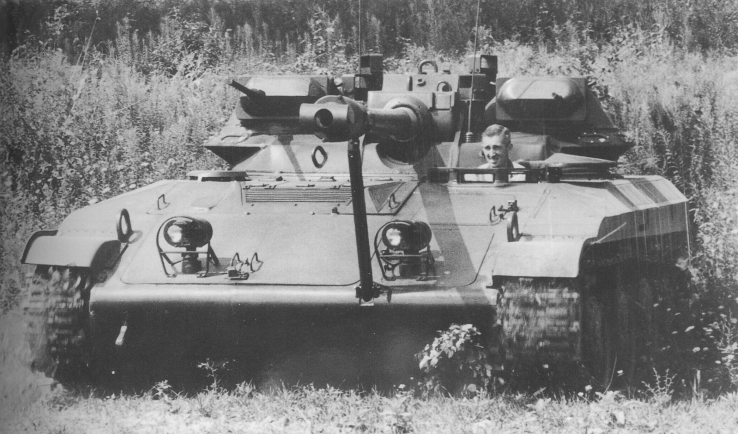 This would later come to be identified as the PT-76. The T92 was assessed to see if it could be made into an amphibious vehicle. This was soon proved to be unfeasible. The effectiveness of the 76mm gun was also now called into question. In a time where the larger 90mm gun was beginning to struggle, the 76mm was now seen as obsolete. Following this, the T92 project was canceled in late 1958. 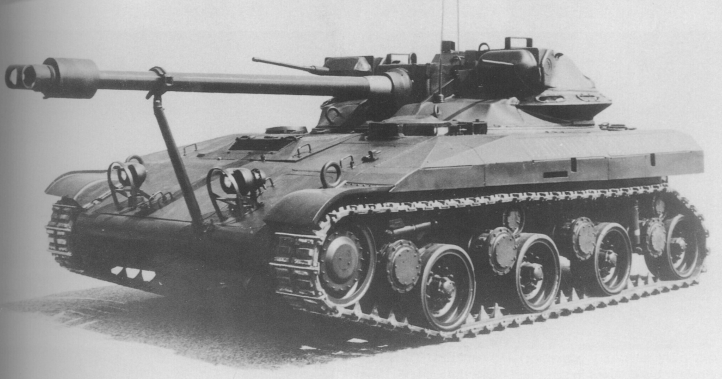 Light Tank design work would then focus on the United State’s own amphibious light tank, ultimately culminating in the problematic M551 Sheridan. One surviving T92 was preserved for a long time at the United States Army Ordnance Museum at the Aberdeen Proving Grounds in Maryland. The tank has since been removed from the site with the closure of the museum in late 2010. It was moved to Fort Lee in Virginia where it currently resides in storage. Cheers guys good article again. The description to the Torsilastic suspension is incorrect. The Torsilastic suspension consist a hollow shaft and a coaxial tube, and rubber between the shaft and the tube. The rubber is sulfurized to make it attached to the shaft and the tube firmly. Torsilastic suspension is widely used on LVTs, and M50 Ontos. Torsilastic suspension eliminated the friction between metal parts and thus doesn’t need much lubrication. The rubber act as elastic element, as well as shock absorber, the vehicle could be quieter and more comfortable to drive.